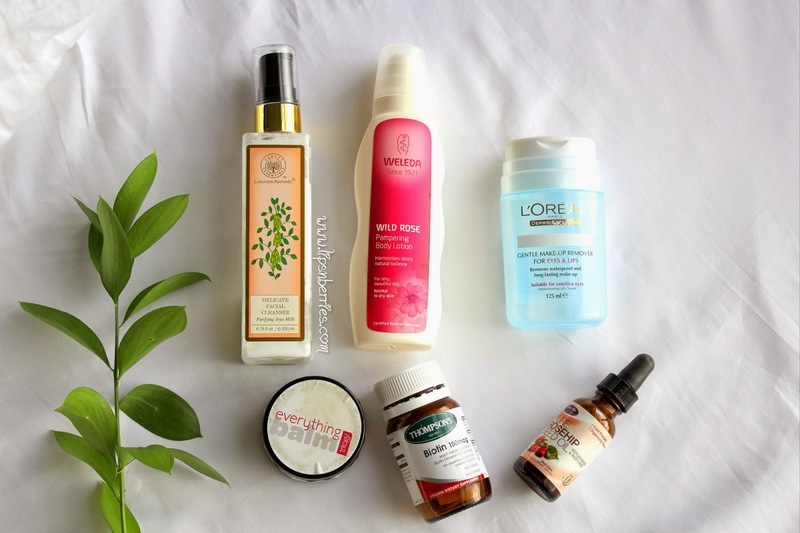 February 2015- Monthly Empties! | LIPS n BERRIES! Can you believe its March already? Didn't we just have Christmas? What is this sorcery? Another month end, another set of empties! To be honest, I'm not even sure how I'm running out of stuff super quick every month- certainly a boon and a bane!! Lets get into it! Shall we? All hail the dry skin. Got dry skin? OK.. Extreme dry skin? This is for you! "Well documented Ayurvedic herbs infused in Soya Milk" is what the brand has to say about this product. It's a facial cleanser but feels more like massaging a lotion on face. You get the feel right? No lather, no stripping of moisture jazz. It's more of that old fashioned cleansing milk in flash packaging! Ok. But it does have some beneficial herbs. 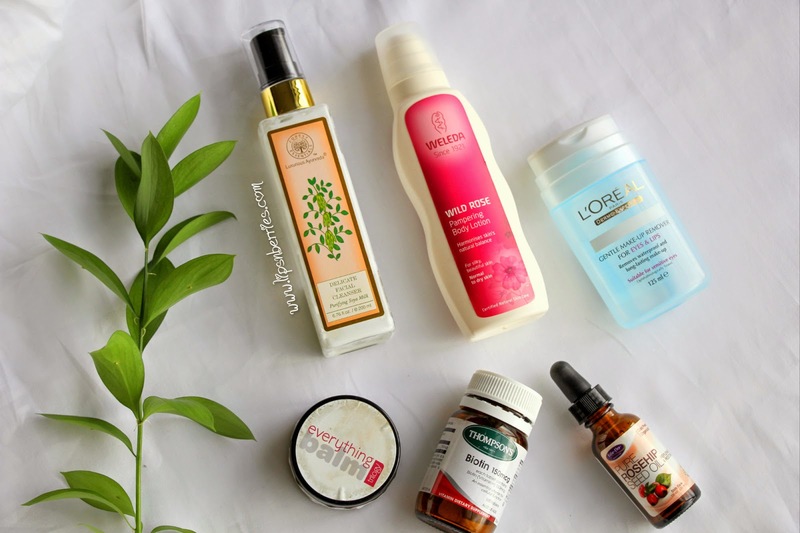 I'm not sure if NZ ever had them but no 90's Indian girl was spared by a touch of Ayur Cleansing Milk - The promises of youthful radiant beautiful skin! Forest Essentials version does the same. It's a makeup remover (put some on cotton pad) & regular dry skin cleanser in one. It has soothing soya milk in it so essentially a luxurious version of an age old favorite. Works great for dry skin, takes off makeup well, doesn't itch eyes. I like it but would probably not buy it again. It's a bit expensive you know! I'd rather cleanse with purifying pasteurized milk..haha! What say? This lotion is LIFE- it has to be- A bed of ROSES. If you're a rose scent fan, I bet you won't be able to resist the temptation to buy it at first sniff. Its divine! So, lets call this rosy affair, an occasional indulgence. This was on my wishlist for ages & after finishing a bottle full, I can say that L'oreal & Maybelline's version of bi-phase makeup removers are like same product packed in two different bottles. Both of them are perfect for removing all kinds of makeup, gentle, kind to eyes, suitable for all skin types, cheap & easily available. I want to say I'll buy it again but guess what!! Garnier's Micellar Water has landed on NZ shores. Finally!! And I'm going to buy that... when I can find it that is! Sold out every damn where. Such is NZ life..
At one point of time I was crazy after this baby and then I lost it and forgot about it. It magically appeared in my drawer few weeks ago (I swear I had a good look..I mean a frickinn good look!). When I opened the jar, the smell was so off..like totally. It's no longer that soothing rosy scent but a pungent n sharp one. Well being a cheapster that I am, I've been using it on my heels ever since. I haven't noticed a huge difference but I blame that to my barefoot habits. I even run barefoot. Its heavenly! May be its the Auckland heat. Anyways, I'm sure its expired so won't judge it. It worked wonderfully during its hey days and it worked everywhere- lips, heels, elbows, face, hands, anything craving moisture! Full review here. I believe Trilogy has even changed its packaging now. I'd happily re-purchase it If I didn't have 625898523 other hand creams n lotions to finish before I die! 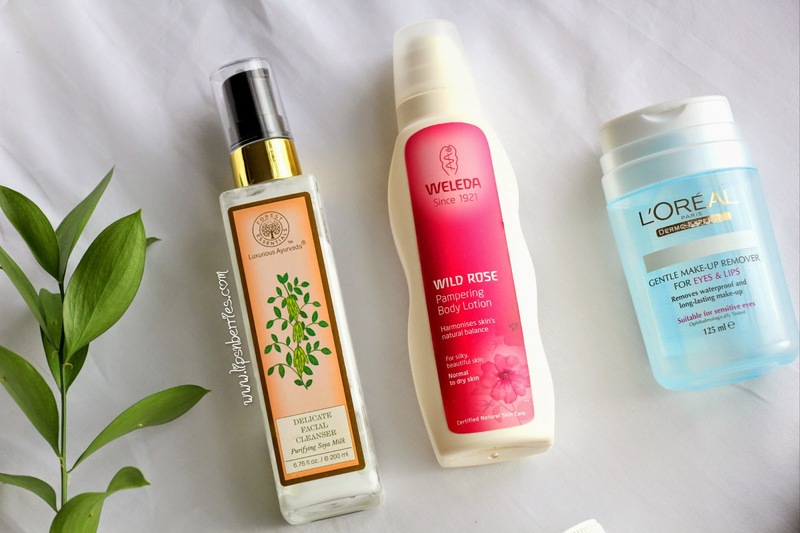 I've written in detail about it in my recent haircare post (Click here). I'd highly recommend you read it! Biotin is my secret/desperate hair growth potion. It works every damn time. Specially when you need long hair fast.. you know for that cousins wedding in a month? Also, there is stuff with pretty high dosage of Biotin available online (Read: 5000 mcg) but I'm quite paranoid of such high doses. Moderation is always the safest key! Disclaimer: Be warned of body and facial hair growth as well. I haven't noticed huge differences but I'm sure it works its magic on them beings too. 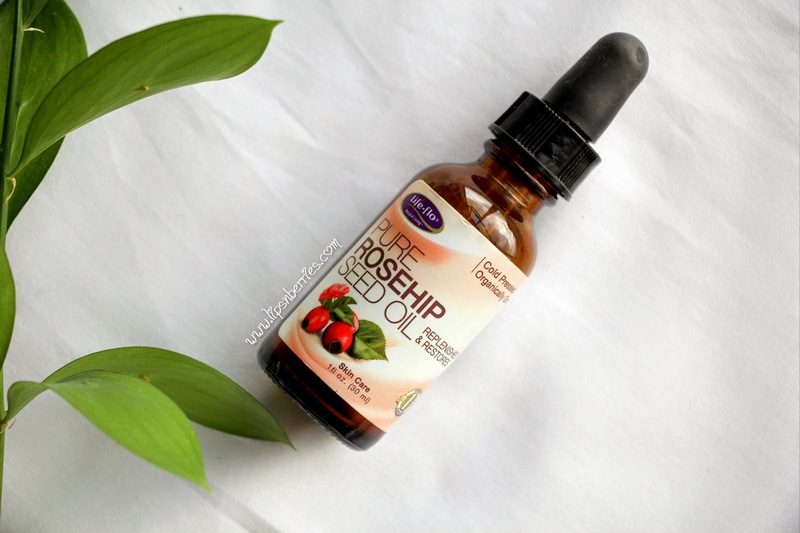 You know I'm a Rosehip Oil activist. I put everyone on this stuff. 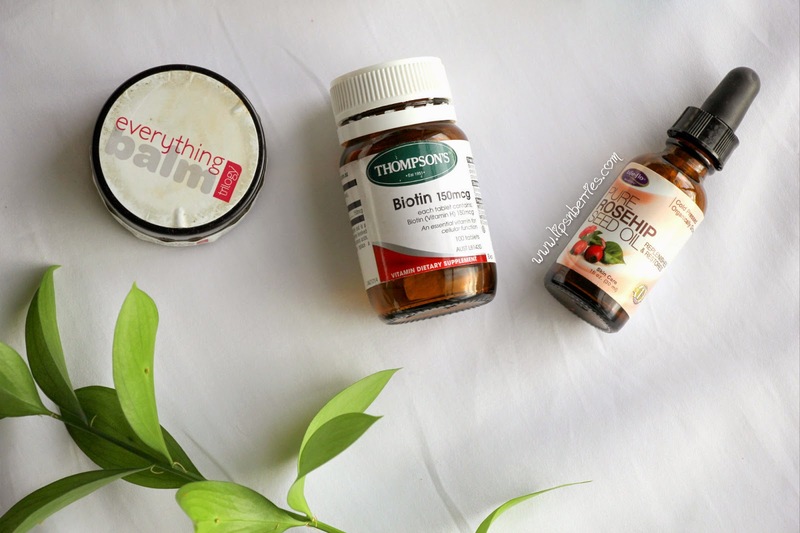 Trilogy's Rosehip Oil (Reviewed here) was getting out of my budget range when I bumped into this munchkin on iHerb.com and I've been hooked ever since. I'm on my second bottle and I absolutely love the results. It's entire skincare in a bottle. I won't write heaps about it as I'm due to write a full review of it in coming weeks. Keep a look out! Did you empty any products last month? Anything on your repeat-buy list?